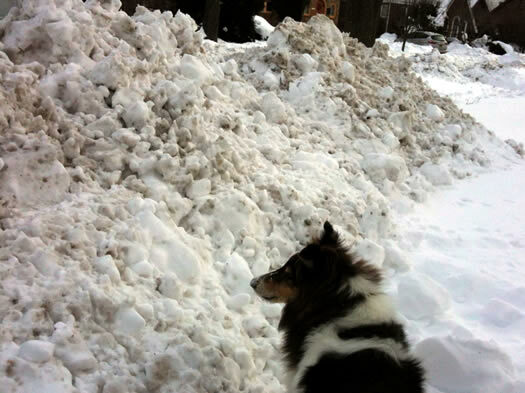 Otto contemplates how to traverse a plowalanche. We've had a lot of opportunity to think about snow this winter -- more than 63 inches of opportunity so far. And like those people in the Arctic who may (or may not) have hundreds of words of snow, we've been thinking about all the different types of snow -- and what to call it. So we've compiled a list. Got suggestions? We'd love to hear 'em. Autoberg - noun - A car that's nearly completely buried under accumulated and plowed snow. Extrication can take an hour or more. Also: carcicle. Blinderbluff - noun - The piles of snow, often plowed or snowblown, that block the line of sight for people trying to pull out of a driveway. Branchalanche - noun - When snow on a branch falls off, especially when someone causes the snow to fall off another person who doesn't expect it. Dry snow - noun - The snow that falls on super cold nights. It squeaks when you walk on it. Fake snow - noun - Snow so light and fluffy and feathery that it almost seems fake. Let-it-snow snow - noun - The snow that falls when you're tucked in somewhere warm and don't have anywhere you have to be. Movie snow - noun - Fluffy bits of gently falling snow, in moderate amounts. Looks like something from a film. Parking lot range - noun - The snowy mountain ranges that rise in parking lots over the course of a winter. Plowalanche - noun - When a plow pile crashes into an otherwise cleared space such as a sidewalk. Example: "I'd walk down the sidewalk, but it's totally blocked halfway down the street by a plowalanche." Plowicade - noun - The plowed snow that blocks where a sidewalk enters the street. Related to the plowalanche, but slightly different because of placement. See other terms. Plow pile - noun - The pile of snow the plow pushes in from of your driveway or walk. The plow pile often appears shortly after you've finished shovel. Sidewalk snow - noun - The sort of snow that should cleared not too long after it's fallen. Slush puddle - noun - The gray, dirty puddles of snow, ice, and water that often gather where the sidewalk meets the street. The puddles are often deceptively deep. And their ability to stain pants is formidable. Snow canyon - noun - The structures that form along streets and sidewalks after successive accumulating snowfalls, especially those formed by plows or snowblowers. Like real canyons, the walls often show signs of the various layers of snowfalls. Snowman snow - noun - Snow that's easily packable, and thus conducive for building snowmen. Also known as snowball snow. Sugar snow - noun - The crunchy, icy snow that verges on sleet. It has the texture of granulated sugar and crunches when you walk on it. Snowcoating - noun - Wet snow blown against all sorts of structures, coating them in sticky layer of snow. Snowy dog face - noun - When snow sticks to a dog's face while on walk. Also: adorable. Snow emergency syndrome - noun - The psychological condition that sets in upon a popular in dense urban areas when cars must be moved because of a snow emergency. It is often marked by frustration and fist shaking. Snowflakes that stay on my nose and eyelashes - noun - The cute kind of snow. Snowglobing - verb - When fluffy bits of snowflakes swirl around in the wind outside your window, like someone's shaken a snowglobe. Example: "I looked out the window this afternoon and it was snowglobing." Touch-up snow - noun - A light accumulation of snow that refreshes the appearance of everything after the previously fallen snow has gotten all grey and dingy. Troy snow - noun - The kind that doesn't get cleared for some reason. Yellow snow - noun - The snow you don't eat. See also: brown snow. *slow clap* Well done, AOA. You had me at Autoberg. "'Sno problem" - When a laid back neighbor responds positively to your request to help shovel. "Widowmakers" - Treacherously large icicles. "ABS Tester Weather" - When there is just enough snow covering the roads that hasn't been touched by a plow yet, causing your Anti-lock breaks to kick into action. snow stroke doggy paddle - watching my dog fail to lead the pack on a snow shoe when the snow was deeper than he was. He had to settle for second in my wake. Snirt - snow dirt; the nasty brown stuff that ends up on the side of roads. Don't even get me started on "Troy Snow..."
Insurance Claim Snow - the snow or ice left on the road after a storm that causes someone to slide and hit other cars. The form of winter weather all of us hate the most - mixed precrapitation - aka sleazy rain. Sludge Bath: The required immediate bathing of small dogs and children after walking anywhere after snowfall. Splatter Shock: The emotion incurred when walking into an important meeting or event and realizing that the back of your legs are covered in salt/snow/dirt. Snowcusing: Using the snow as an excuse for missing/being late to every unpleasant responsibility.